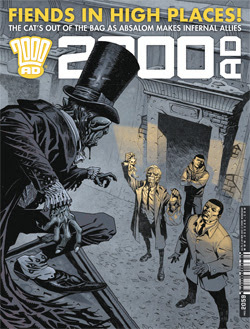 Some thoughts on this week’s prog of 2000 AD. Dredd’s escape is well done, work some really nice visuals. I’m unsure how he’ll get out of this, but he’s going to have some team up with the East Meg 2 judges. I wonder if this is building up to something bigger with East Meg 2. I’m enjoying this are though as Dredd is out of his comfort zone. Slaine comes under attack in this issue, but there isn’t too much action in this issue. What we do get though is a good look at what the gods have in store for the humans. It’s kind of familiar, and a nice touch. I have a feeling we’re coming to the end of this excellent arc, but not the story! Sinister & Dexter’s return to Downlode had been quite fortuitous, but there are a few winkles in their return. That was alluded to earlier in one of their first adventures back and now we’re revisiting it! The build up is pretty much devoid of the duo, but their presence is felt! The middle of this story is still going is a bit of mystery, but it’s building up well. The treasure is still out of reach and it seems that things are falling apart for the thieves. I like the way this story is told and the setting worth the art are really well done! Absalom’s team begins to take shape, with some unwilling members. The plan of one of them is well told and I wonder how this will all end up. The other is more mute, with an excellent chase scene!